I was so focussed on gorillas that I never gave any thought to the bird life. 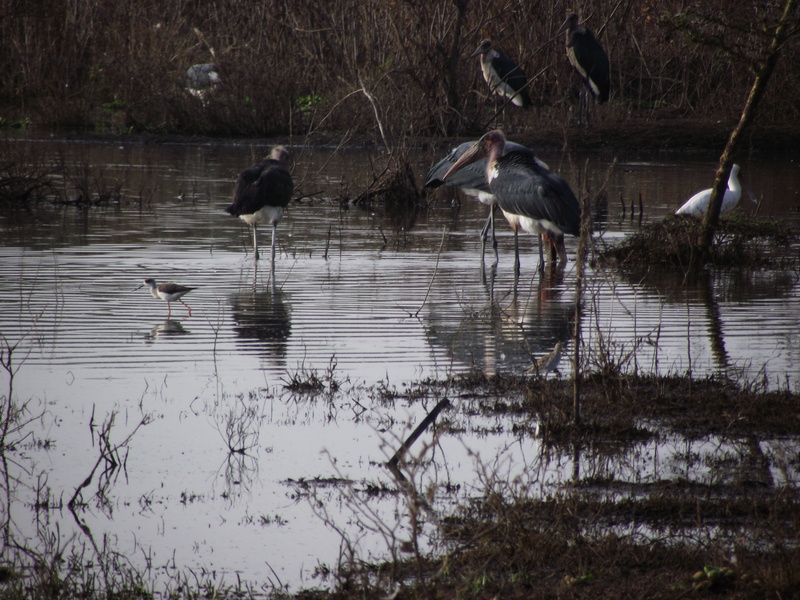 We saw enormous Maribou Storks hovering over Nairobi , impressive African Eagle on the Nile, the dainty Masked Weaver, all types of Kingfishers and the multi coloured Superb Starling, to name just a few. East Africa is a birders feast. A dedicated birdlife post is presently under construction. 2. 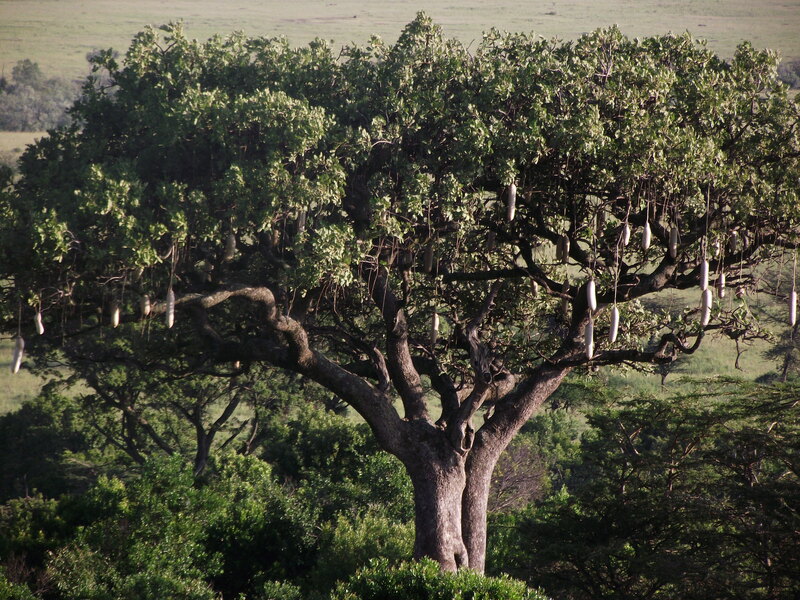 The African Sausage Tree. The fruits sway in the breeze and at first I thought they were light weight seed pods. Then I was given one which after lugging around for a few days, I dumped. They are solid and very heavy, and as you will soon understand, I decided I had no use for it at all. The uncooked sausage like fruit will cause painful blisters to the mouth if eaten, and green fruits are allegedly poisonous. It is commonly used as part of traditional beer making and aids the fermentation process. When crushed the pulp is a remedy not only for ulcers, but for syphillis as well. Good to know. 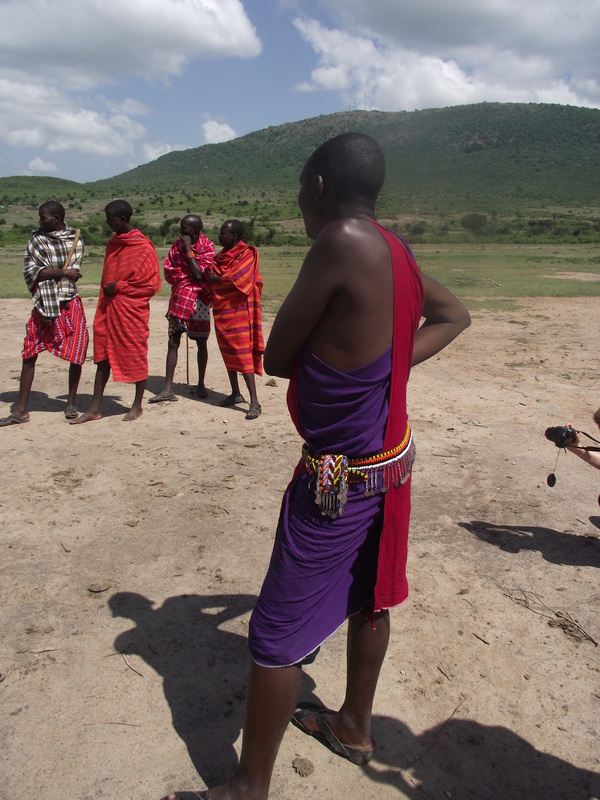 They danced, they jumped high into the air, and they took us on a tour of their village and huts. They made a fire by rubbing hardwood and sandpaper wood together, and told tall tales of hunting and killing a lion as part of a rite of passage into adulthood. I am not an adventurous eater, but I really enjoyed Jackfruit. I was having my hair braided in Jinja, it was way past lunchtime and the guestimated one hour was turning into three. Rosie, the lady who was doing my hair offered me some and it would have been rude to refuse. After 3 hours of weaving plaits into my hair and talking non stop, we were best friends. 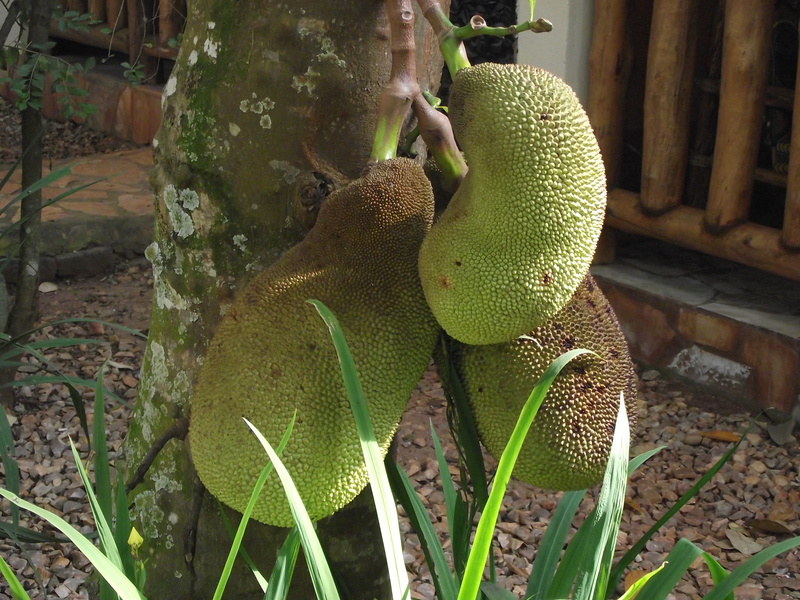 The Jackfruit is about the size of a watermelon and is high in starch and fibre. The skin is rough and nubbly, but the fruit inside is a yellowy butternut colour. The only way I can describe the taste is like a blend of banana and mango. Very filling and totally delicious. Later that day I had it cooked like a French fry, a totally different taste but just as good. We were told by our guides not to photograph these unusual animals under any circumstances. Initially we understood it to be illegal, as we had been told the same about certain bridges, military men and specific buildings. 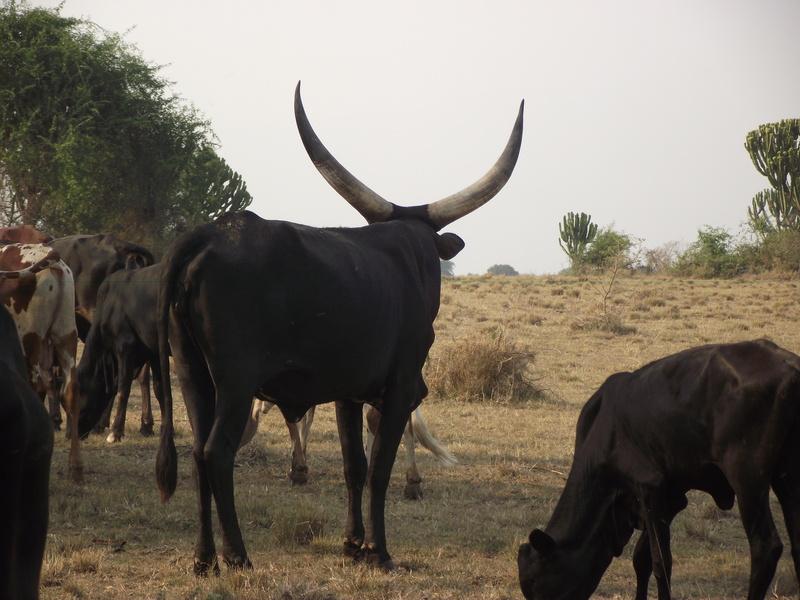 Apparently it is legal, but the herdsmen or owners of these beasts have been known to charge tourists up to US500 for a picture and can become aggressive if thwarted. We were dying to take some photos but did want to risk trouble in a country that spawned Idi Amin. Arriving in Queen Elizabeth National Park we were clicking feverishly after being told that we had permission to photograph this herd. These cattle make regular cows and bulls look like Cinderellas ugly, boring sisters. They come in all shapes sizes, colours and patterns, and the size of the horns varies. Placid and friendly, they came right to our chalet to eat a small tree and then ambled off unconcerned by 4 camera wielding tourists, clicking and shrieking in their midst. A very popular form of transport, these generally 80 cc Boxer motorcycles amazed me. The do not travel very fast, no helmets are worn, and they carry anything. We saw 5 people on one bike, 2 men and a ladder, a wheelbarrow, crates of eggs and anything else you would think impossible to transport by motorcycle. Legislation has been brought in making the wearing of crash helmets compulsory, but the Minister decreed that she would allow a 2 year phasing in period, as the law had been met with very little compliance. The average speed is probably about 40km per hour, but in the cities the traffic congestion makes it a much faster way of getting from A to B. In the rural areas the main form is transport is a boda boda or a bicycle. What I loved was the pride of ownership. Riders waiting for a fare would either be preening, laughing or polishing handlebars. Many of the Boxers had the tanks decorated in brightly coloured, fringed fabric. I really regret not making time to do a tour of Kampala on a Boda Boda, I was told it was well worth it and quite safe, and helmets are provided! Initially disappointed that almost all signage was in English rather than Swahili, I soon became fascinated by the never ending names on almost every building we saw. Not limited to the cities, even the smallest villages and tiniest clusters of dwellings on the side of the road boasted quirky, creative signs. Often citing European or American cities somewhere in the name, many signs were a mishmash of delusions of grandeur, African humour or descriptive promises. Capturing signs on camera could be a trip in itself when travelling in Kenya and Uganda. Entering Nairobi I was very taken with the traffic lights. As the light changes colour, so a countdown from 90 seconds begins. I am sure this prevents frustration, jumping lights and aids the order in the crazy traffic. You can use it to your advantage by knowing if you have time to jump out of your car to buy something from the side of the road, make a cell phone call, or retrieve something from the boot. I think it is a brilliant idea. Sorry, never got around to getting a photo of one. 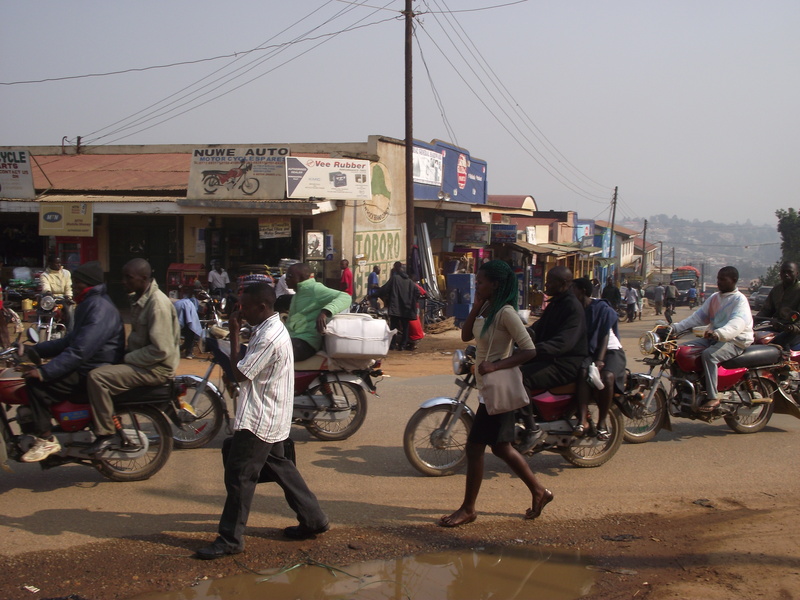 The boda boda sounds intriguing – a “real” way to experience Uganda. Your comments about the tradition of fascinating shop names in Africa made me think with nostalgia of some from my travels. 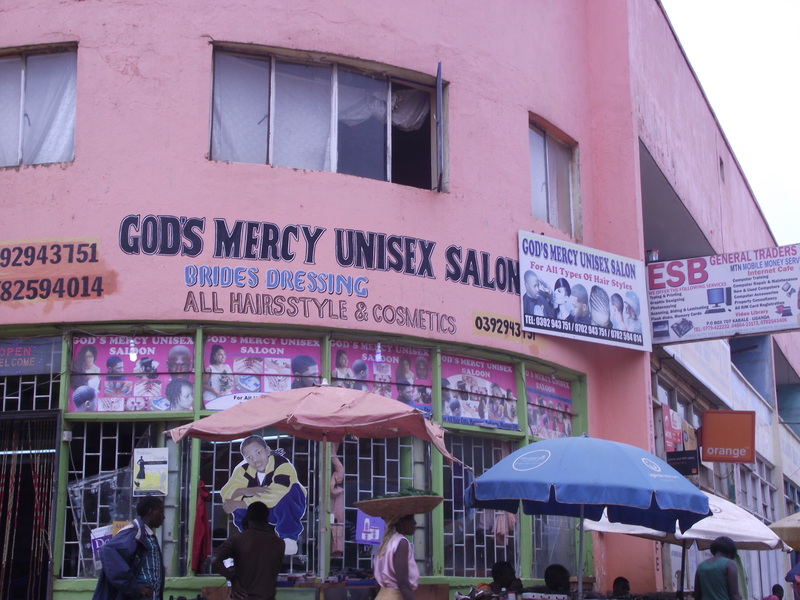 One of my all-time favourites was the “Where God Says Yes Barber” we saw in Zambia. Hi Roxanne. Take a look at Dawn Jorgansen (The Incidental Tourist ) and Linda (Moving Sushi) blogs. They have written great posts about the boda boda experience.